The ferry ride to Wittier is lovely and we hang out on the deck and chat with a couple from Valdez for most of the journey and some young travelers while waiting to disembark. Everyone suggests the town of Hope as a place to check out so, Hope is out next destination. Once we arrive in Wittier, we head straight to the Portage Glacier Access Road. We arrive at the staging area for the Anton Anderson Memorial Tunnel (AKA the Wittier Tunnel) and have a green light… no waiting… and no toll… this direction is free… woo hoo! The single lane tunnel uses a computerized traffic-control system that regulates both rail and highway traffic. The speed limit is 25 mph and it takes just under seven minutes to travel through the tunnel. 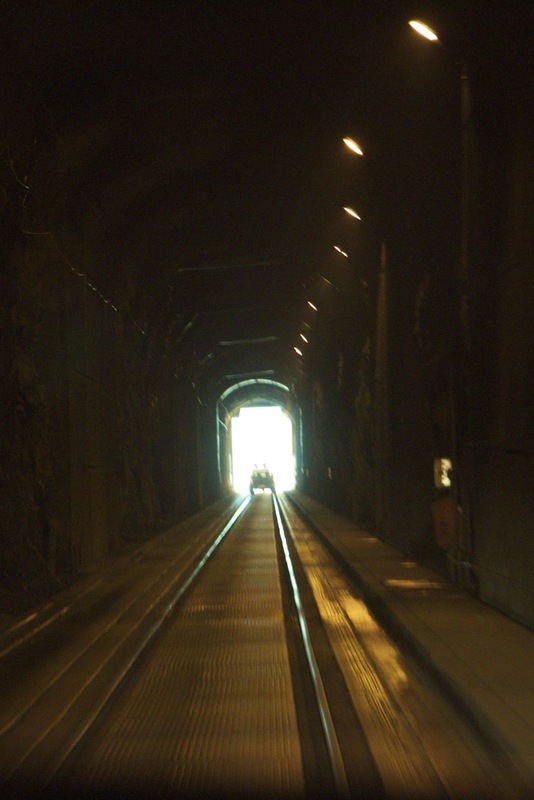 This is the longest highway tunnel and the longest combined highway/railroad tunnel in North America at 13,200 feet. Once through the tunnel we pull over and check out Portage Lake, Byron Glacier and part of the receding Portage Glacier. Continuing on to the Seward Highway we head south and then detour onto the Hope Highway. 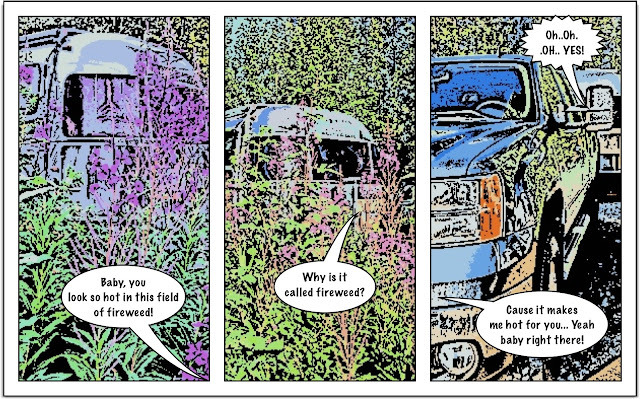 Just before the town of Hope, we stop at Alaska Dacha for a full hook-up RV spot. While settling in, the power goes out so we head into town hoping to get some lunch. Once in town, we realize that the power is out here too. The restaurant has turned their sign to ‘CLOSED’, but there’s an ice cream truck and they are serving. So what’s so wrong about an ice cream sandwich for lunch? Especially when the afore said sandwich is made from huge home made white and dark chocolate chip cookies filled with high quality vanilla ice cream? While chomping on our sandwiches we walk over to the mouth of Resurrection Creek and watch some anglers take Red Salmon to their final destination. Founded in 1896, Hope was a short-termed gold mining camp. Many of the original buildings still stand although their use has changed. There is still gold in Resurrection Creek and folks are still working the stream looking for wealth. We drive around the area on gravel roads and enjoy the scenery. At the Hope and Sunrise Historical Museum we meet Billy Miller. Billy is 87 years old, a wounded veteran of the Korean War, and now legally blind. He takes us around the out buildings showing us special artifacts and tells us how he rebuilt the log structures when they were moved to the site. The history and his tales about the people are fascinating. We know that this is a special day for us, and one that will not be repeated for others too may times in the future. Note: There are three choices for RV camping in Hope. Alaska Dacha with full hook-ups just before town, the in-town campground at the mouth of the Resurrection creek with electricity only and the Porcupine USFS campground at the end of the Hope Highway for dry-camping and incredible views. If we return, Porcupine would be our choice for a few days here. Then it’s on to Seward past the Exit Glacier and into town on the shore of the Resurrection Bay. Here we stay at the Waterfront Park Municipal Campground. Spaces are self-register-first-come-first-serve some are dry camping and some have water and electricity. The place is a zoo as folks scramble for the best spots along the waterfront. Check out time here is 4:00 PM (as opposed to 11:00 AM in most other RV Parks) so timing is also part of the equation. There is one spot open on the landside of the front row and we pull in. We have water and electricity, no ocean view from the gaucho deck but it’s OK. 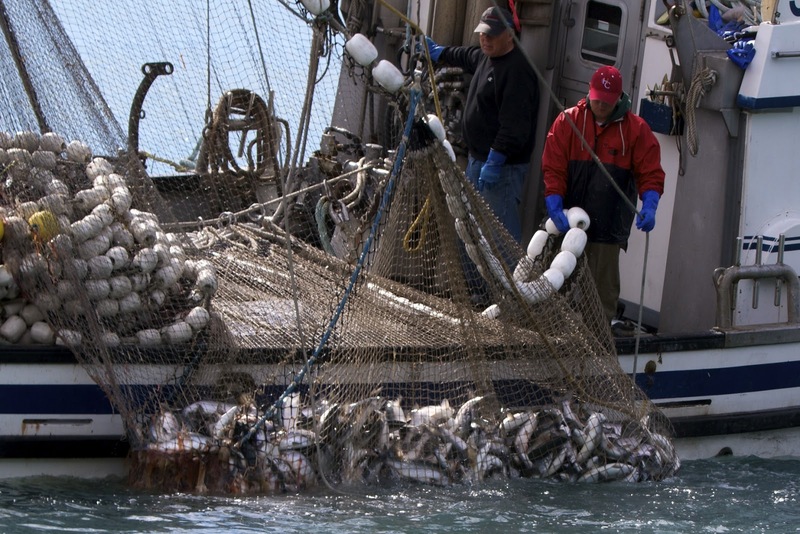 Most of the attractions in Seward revolve around fishing charters and glacier tours. For us, fishing is stopping at Captain Jacks to pick up some ‘catch of the day’ fresh halibut for dinner and the freezer and we’ve pretty much done our share of glacier tours. So we’re content to walk around the harbor and town and enjoy just hanging out. 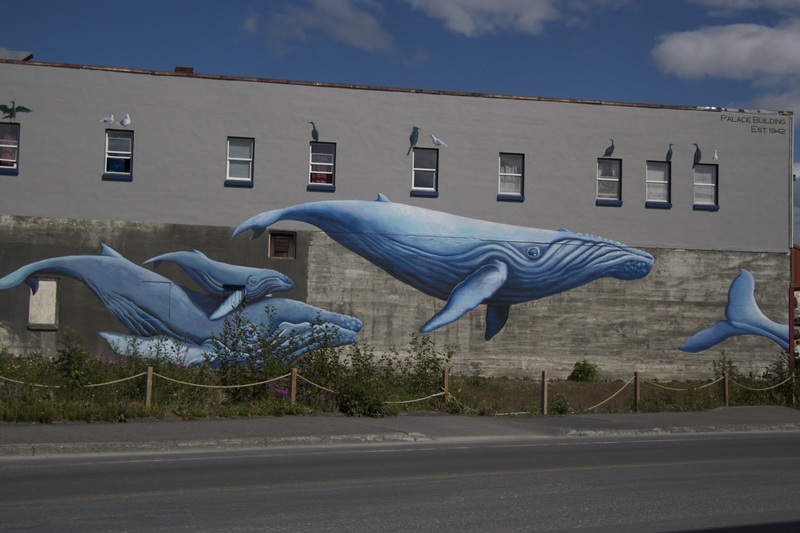 Seward is the Mural Capital of Alaska. The Seward Mural Society offers a walking tour flyer that shows the location of sixteen murals. Murals have been added since it’s publication and we find most of the twenty murals scattered about the town. 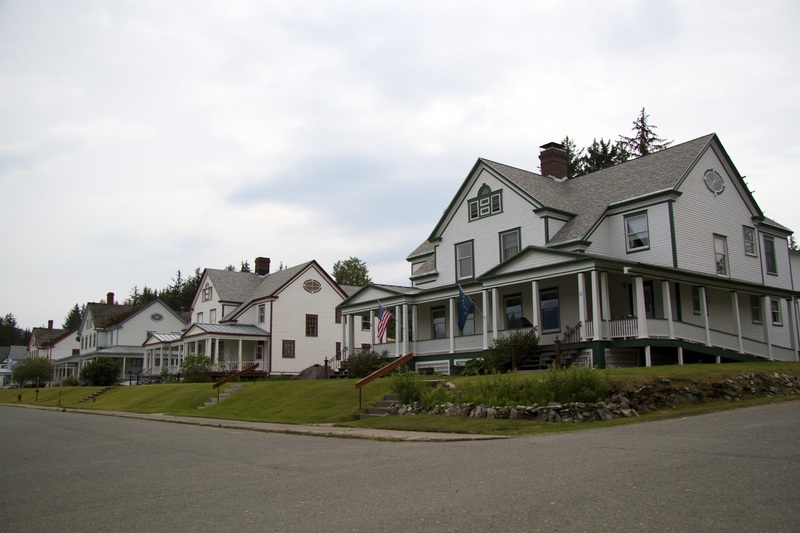 The town boasts many well-preserved early twentieth century buildings and a walking tour map from the Seward Visitor Center gives us a little information on the buildings and their origins. A must see is the Hotel Seward Lobby with their extensive collection of Dead Art. The Alaska Sea Life Center hosts a public aquarium and a modern marine research and rehabilitation facility. 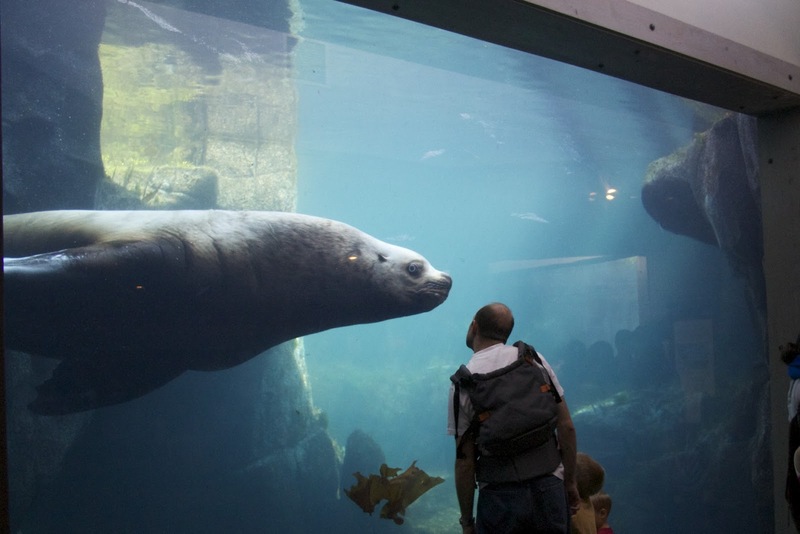 The aquarium features Alaskan sea life and marine mammals and is what we expect from a twenty-first century public aquarium. But the real action takes place in the back of house. We take a behind the scenes tour and learn about the logistics of feeding the aquarium residents and check out the rehabilitation section where sick and injured birds and mammals are being treated. There is a lab with video monitors that have a live feed from solar powered cameras mounted in the Stellar Sea lion rookeries. A biologist monitors the population making notes on a huge spreadsheet for analysis. 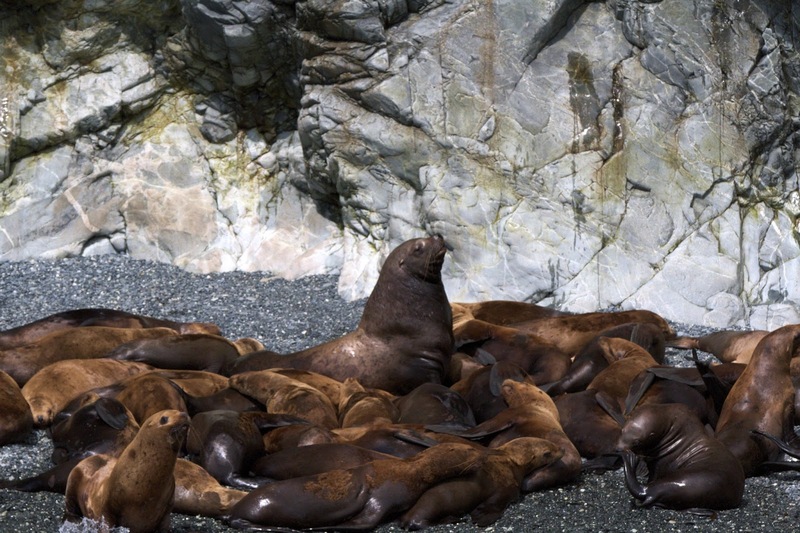 Individual sea lions can be identified by the edges of their rear flippers so the live visual gives the scientists data about individuals as well as the colony. The drive over Thompson Pass into Valdez is stunning. 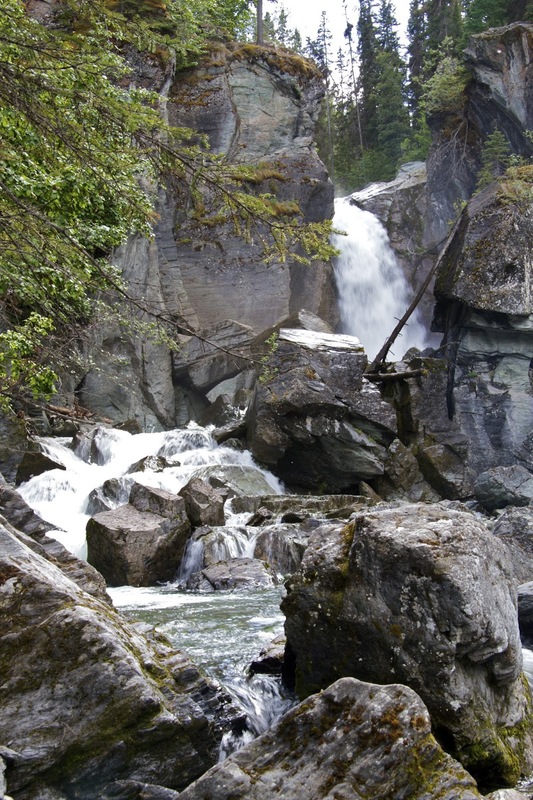 Waterfalls cascade down the canyon walls and the Thompson Glacier sparkles in the distance. Arriving in Valdez we check into the Bear Paw RV Park. This park has two sections, one nondescript parking lot across from the harbor and the Adult Park along the waterfront. We opt for the waterfront. From here we watch the fishing boats go in and out of the harbor, framed by the municipal wharf and the Alyeska Oil tanksat the Pipeline Terminal on the far side of the bay. The facilities are clean and the Wi-Fi good. Instead of a centrally located dumpster for refuse, there are 50 gallon plastic trashcans conveniently located around the park. BUT, there is a note on the laundry room door stating that, there is a bear in the area and please don’t put your trash out overnight because we don’t want to have to shoot him! 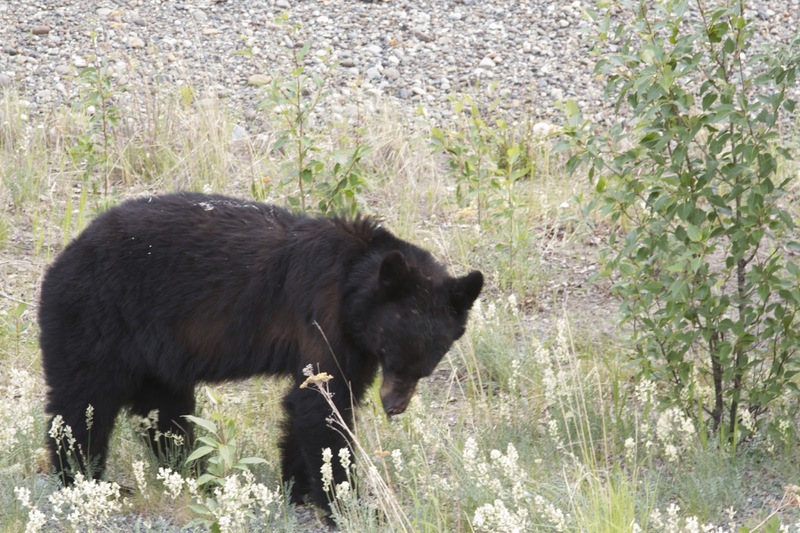 I talked to the maintenance man and he told me that the bear had been coming around and getting into the garbage, but they bear-sprayed him a few days ago and was hoping that he would not return. 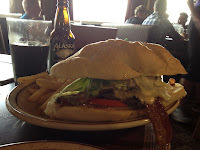 Forging in Valdez is good. There is a newer Safeway for basic provisions and the Peter Pan Fish Marketplace for seafood. Peter Pan is a large processor of fish in the Pacific Northwest and we pick up some halibut fillets and spotted prawns for about half the cost of retail fish markets. We book a tour with the Lu-Lu Belle to visit the ColumbiaGlacier. This tour was recommended by a few folks that we met during our travels and has many positive reviews on-line. The Lu-Lu Belle is a lovely boat. It’s small with lots of wood and faux oriental rugs but it feels a bit cramped as we are traveling at near full capacity and there are not enough indoor seats for everyone during the mandatory safety orientation. The weather is perfect and we head out of the harbor. The captain starts his commentary on the area and seems to end every topic with an off the wall comment. Just past the municipal wharf, we are treated to a couple of rafts of sea otters. They are obviously used to the boat traffic and just float on their backs as we slowly circle them. Further out the purse seining fishing boats are laying out the nets and we watch a nice haul of pink salmon loaded into the hold. Continuing down the sound, the captain draws the boat right up to the shore (we’re talking a couple of feet here) of an island with steep vertical cliffs. We are looking for puffins that don’t seem to be around. The topic changes to the Stellar Sea Lions. Pulling the boat around the bend we come to a narrow beach teaming with these huge creatures. The boat is only a few yards from the shore and some of the sea lions are a bit agitated by our close proximity. 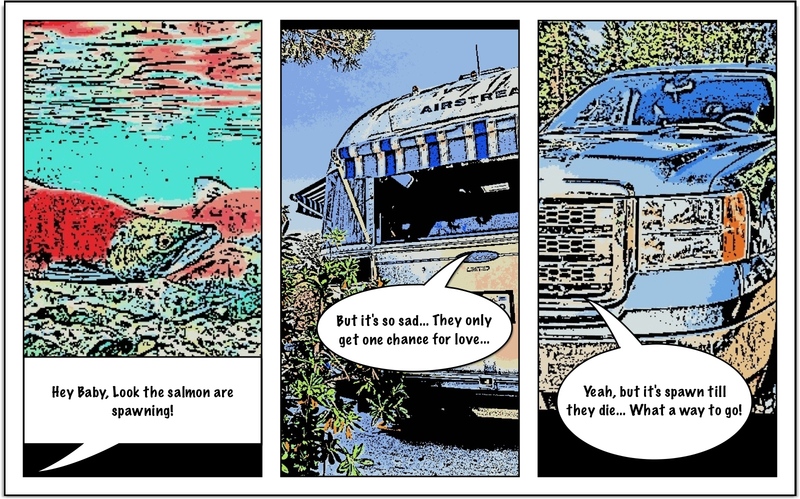 It is apparent that the captain has no love for these creatures or their southern cousins the California Sea Lions because in his opinion: they eat too much of the salmon, they stink and should not be classified as an endangered species. 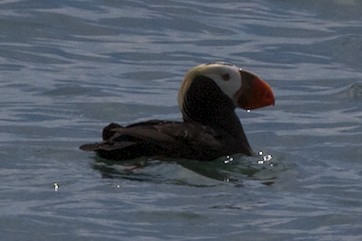 Once we pull away from the island we see the puffins cruising on the water and flying about. More skewed commentary as we pass the site of the Exon Valdez oil spill with emphasis on the cost of the safety measures now mandated because of it. As we approach the Columbia Glacier the captain circles a mother otter holding her baby, the mother dives down and vanishes from sight. Then we continue on and pick our way through the ice. It’s the only time the captain is quiet. The glacier calves a bit and we head back to Valdez. The boat has a small snack bar. Chris gets a nasty hot dog and I have a watery bowl of tasteless clam chowder. YUK! On the return trip the captain takes the opportunity to share his misogynistic opinions on: government regulations, unions, the environment and foreign ownership of American based businesses with his captive audience. There are speakers everywhere on the boat and we cannot escape his ramblings. It’s like watching a Nat Geo show with a Rush Limbaugh commentary. We now have headaches and we just want him to STFU! Once we dock, we can’t get off the boat fast enough. Despite the glowing recommendations, this was certainly not the tour for us. We book a second tour. 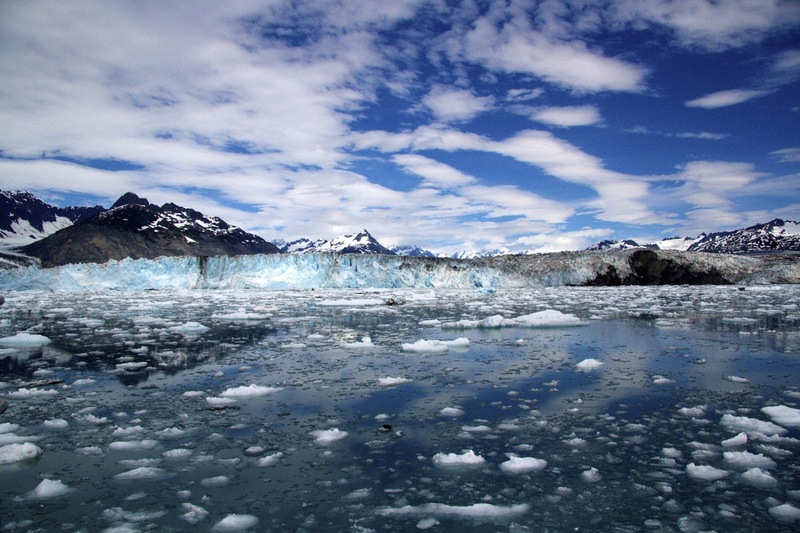 This time, it’s with the Stan Stephens Tours on the Valdez Spirit to the Meares Glacier. This boat is a 82 ft. catamaran we are at about 60% capacity, but there are enough indoor seats with huge windows for a full house and it is much more comfortable than the previous tour boat. Again the weather is perfect. Our Captain Amanda Bauer begins the tour with much of the same dialogue on the history of the area (without snarky editorial comments.) She is articulate and very knowledgeable about her topics. She explains how the Alaska pipeline and the oil tanks were designed for a thirty-year lifespan. It’s now been thirty-eight years. With maintenance and improvements they may be used for about fifty years. We pass the rafts of otters, the purse seiners and Bligh Reef the site of the Exon Valdez oil spill where she tells us about the event, how unprepared anyone was for a disaster of this magnitude, how there is still cleanup going on in Kodiak and the Aleutian Islands, and some species of sea life have not recovered. Now there are improvements, processes and special equipment in place to help prevent this type of disaster and mitigate the destruction if a spill were to occur. Passing the entrance to the Columbia Glacier, Amanda explains that the Columbia is a retreating glacier and the Meares is one of the few advancing glaciers. At this point we feast on a lovely lunch of chicken with Alfredo sauce on a bed of rice with steamed vegetables, rolls and butter and Oreo cookies for desert. 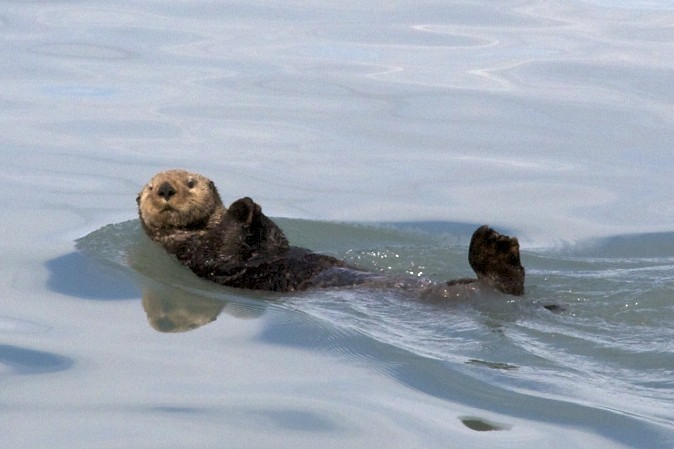 Heading toward the Meares, we spot a mother otter with her baby, the boat veers to the side away from the otters because baby otters do not know how to dive and if the mother dives too fast to get away from the boat, the baby can drown. 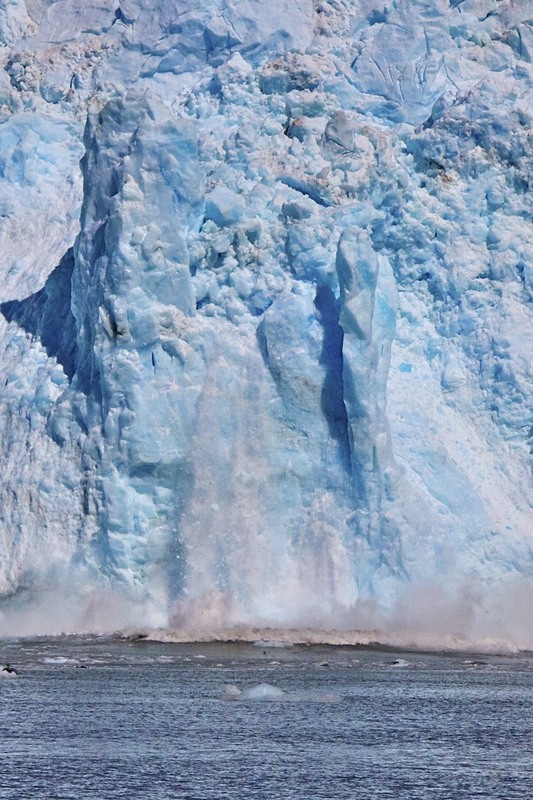 At the base of the Meares, we sit in silence and watch spectacular calving as two huge chunks of ice, fall from the face of the glacier into the sea. On the return trip we cruise by the epicenter of the 1964, 9.2 magnitude earthquake. Amanda spots some Dalls Porpoises but they seem more intent on heading away and don’t stick around to play. And then someone spies a whale spout. Our captain heads the boat in the direction and soon a 40 ft. humpback breaches off the bow. We slowly circle the area and are treated to a real show. 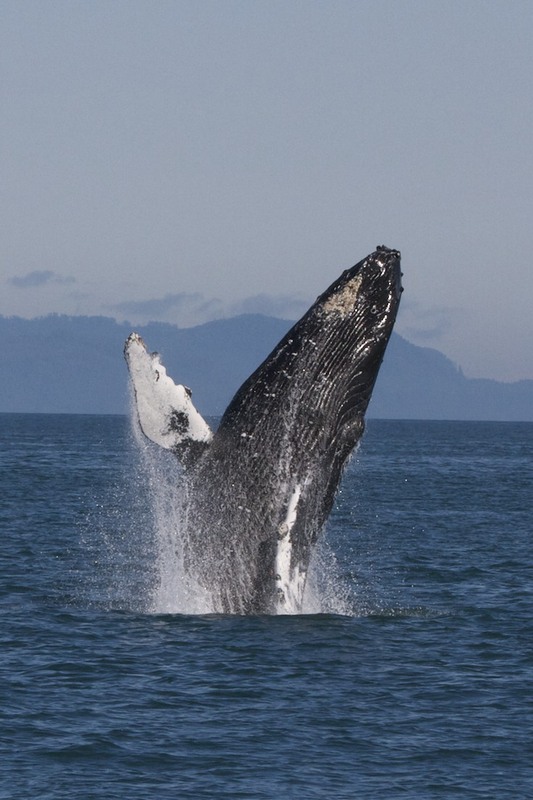 This whale is breaching then swimming on his back with his large pectoral fins waiving in the air and then diving and breaching. This goes on and on over and over, waiving pectorals, rolling, diving and breaching. Everyone watches in silence and awe. We finally have to leave and Amanda states that this is the first time she has ever had to leave a frolicking humpback before it’s done. We cruise around past the Stellar Sea Lion Colony and observe them from a distance. Amanda explains that although the colony in the Prince William Sound is stable, they are endangered because all of their other colonies are in decline. Then we head off to watch the puffins doing their puffin thing. Before returning to port, we have a lovely bowl of clam chowder that’s tasty and full of goodies. It’s a beautiful relaxing ride back into port and we wish the day could go on forever. Across the bay is the Solomon Falls Gulch Fish Hatchery. They incubate and release the Pink (Humpback) Salmon that are currently being caught in the sound. We visit the hatchery twice but the salmon are not running yet and there are no tours offered here. 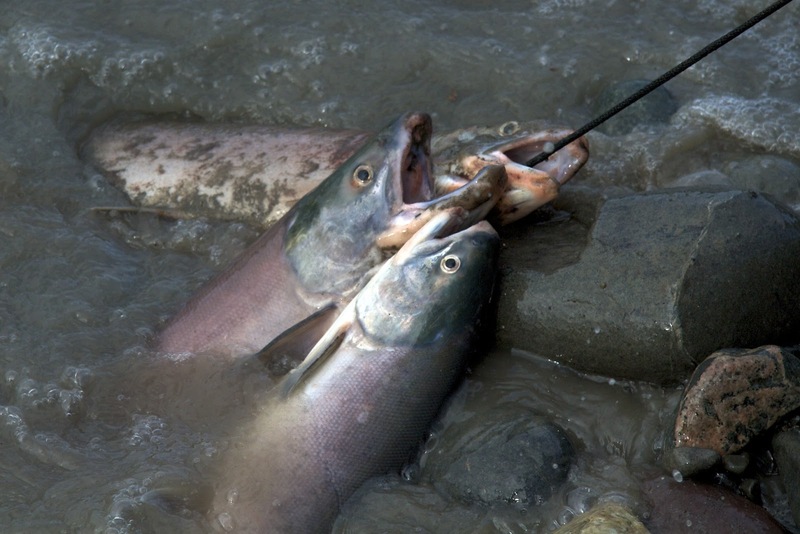 However, there are some salmon nearby as indicated by the seals, that surface occasionally with a fat salmon in their mouths. We also drive out to the Old Valdez Site. The city was rendered uninhabitable by the 1964 earthquake and accompanying tsunami. It was relocated two and a half years later to the present site. 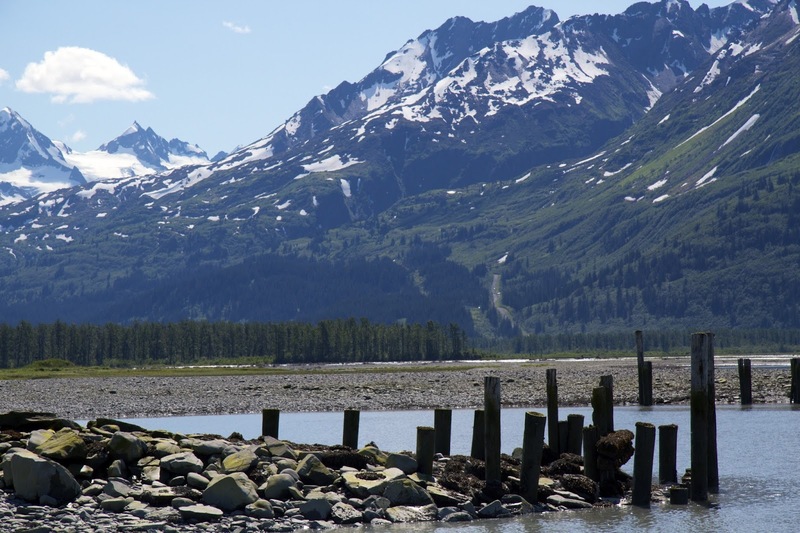 All that’s left of Old Valdez are decaying pier pilings. The salvageable buildings were moved to current Valdez and the rest were burned. Now the earth is slowly reclaiming the city site. The Valdez Museum Society has two locations. The Museum Annex near the ferry terminal is dedicated to Old Valdez, with artifacts, a scale model of the entire town and short film about the area, the destruction and the relocation. 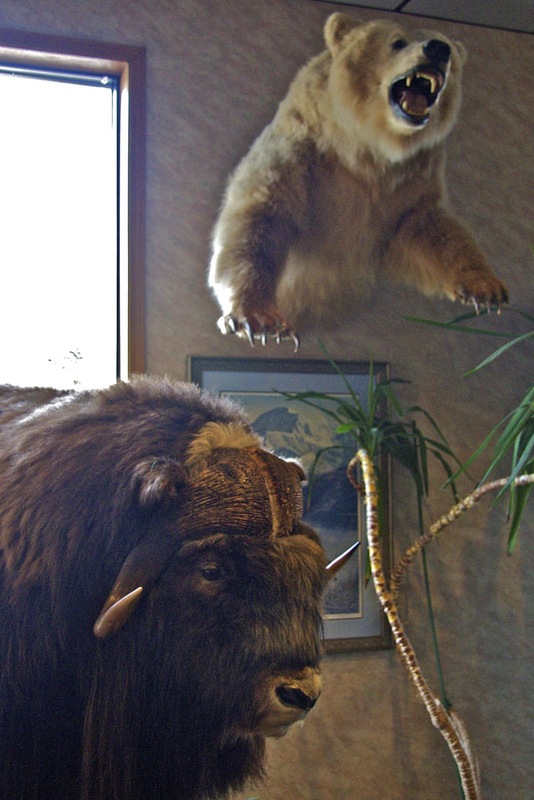 A few blocks away, the Valdez Museum is a wonderful place to learn the history of both Old and New Valdez. They have some wonderful exhibits including the beautifully restored original fire wagon. 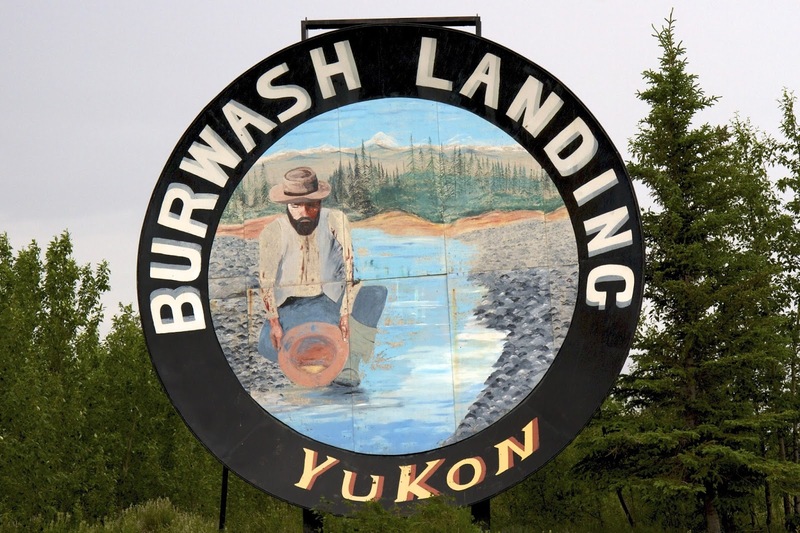 We watch a short film about the history of the city from the native fishing villages to the boom and bust cycles: as the gateway to Yukon gold, the destruction and relocation after the 1964 earthquake, the building of the Alaska Pipeline and the current economy of oil, fishing and tourism. On our last morning the Bear has returned. He has systematically turned every trashcan over and gone through the contents. A park employee arrives and chases the bear off, but the bear lets him get pretty close before running away. I can’t help but wonder why the park uses plastic trashcans and not bear-proof receptacles? They know that bears come into the area for the salmon, why make it easy for them to stay for the garbage? This bear is back, he has no fear of people, and he will become dangerous if allowed to continue this behavior. He’s a dead bear walking. We head to the terminal to catch the ferry to Wittier. On the ferry we meet a couple from Valdez, they tell us that on their way to the ferry they saw trash cans by the post office turned over by the bear. I show them the photo I took earlier. We talk about bears and they mention that last year, thirteen problem bears were shot in Valdez. 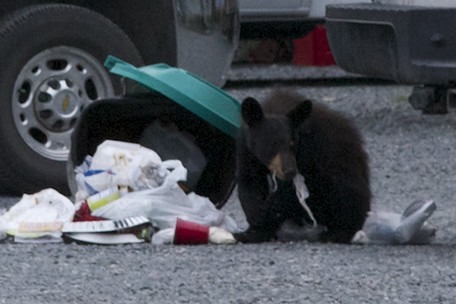 Thinking back I don’t recall seeing bear-proof trashcans around Valdez. OK, so obviously bullets are cheaper than bear-proof trashcans… but WTF? We head down the Tok Cut off. It’s a patchwork of good highway going bad – frost heaves, damaged pavement and some improved sections. 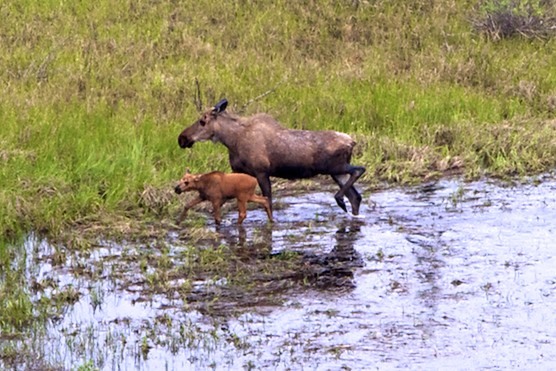 We keep an eye out for wildlife and see a couple of moose and a lot of spectacular Alaskan scenery. 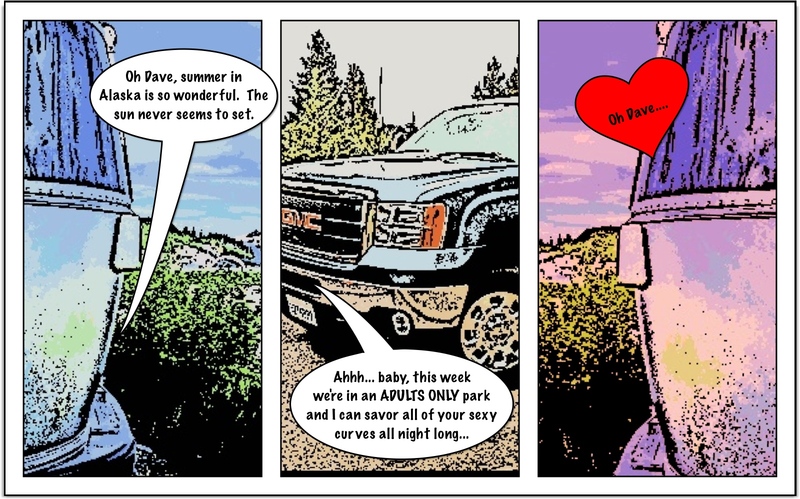 Sixty-five miles outside of Tok, we turn up Nabesna Road and pull into the Hart D Ranch, a wonderful B&B lodge and RV park with a fine arts gallery. Owner/ Bronze Sculptor Mary Francis De Hart greets us at the door. Mary is a beautiful older woman with a quick smile and a sparkle in her eyes. She gives us a quick tour of the immaculate facilities, gives us the 411 on the Wi-Fi and lets us know that she will be out in the back mowing if we need anything. Since the place is empty we have our pick of spots. We choose one that backs up to the forest. All of the spaces have a picnic table and metal chimera style fire pits. Colorful rainbow heart flags flutter from poles around the lodge. Lots of Mosquitoes - but no problem – We have ThermaCELLs! Nabesna Road is the Northern Entrance to the Wrangle-St. Elias National Park and one of the only two roads into the park. 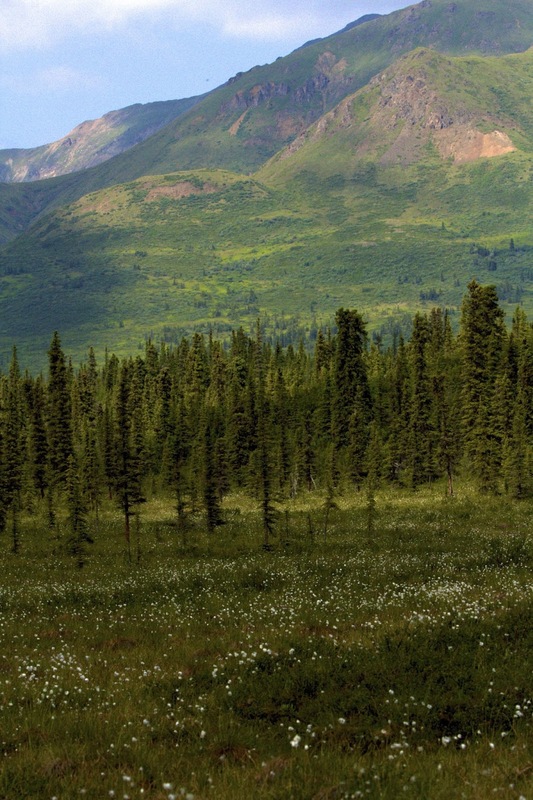 This park is the largest National Park in the nation (Six times the size of Yellowstone!) and mostly undeveloped. Nabesna road is a mix of paved and unpaved but is a pretty easy drive. At 27 miles we check out the Kendesnii campground. It’s a beautiful site at Twin Lake. It’s new with spaces for tents and smaller RVs and it’s FREE! We chat with a couple of rangers and they inform us that the road may not be drivable in another few miles. We continue on and sure enough the road is washed out at the 30-mile mark. So we turn around and head back. 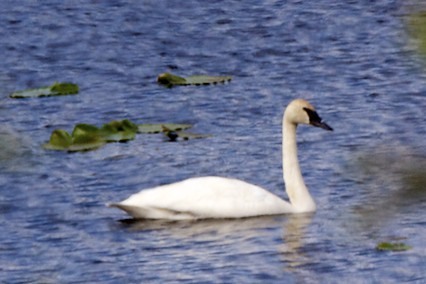 On the return trip we see some Trumpeter Swans and just enjoy the scenery. We continue on to the Red Eagle Lodge. This is a quaint 1920’s Roadhouse establishment with upscale amenities. Richard and Judy Dennis are wonderful hosts and we feel right at home. 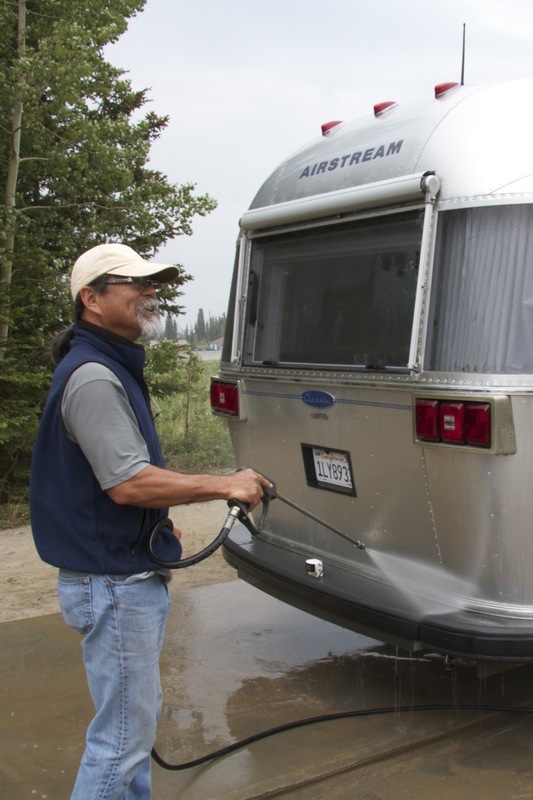 There are no specified RV spots but they provide electricity for RVs and places for tent campers. We find a level spot and run a power cord from the bathhouse over to Dimples. They have a collection of original 100 year-old log cabins decorated to reflect the original period, but outfitted with high quality bedding and upscale amenities. 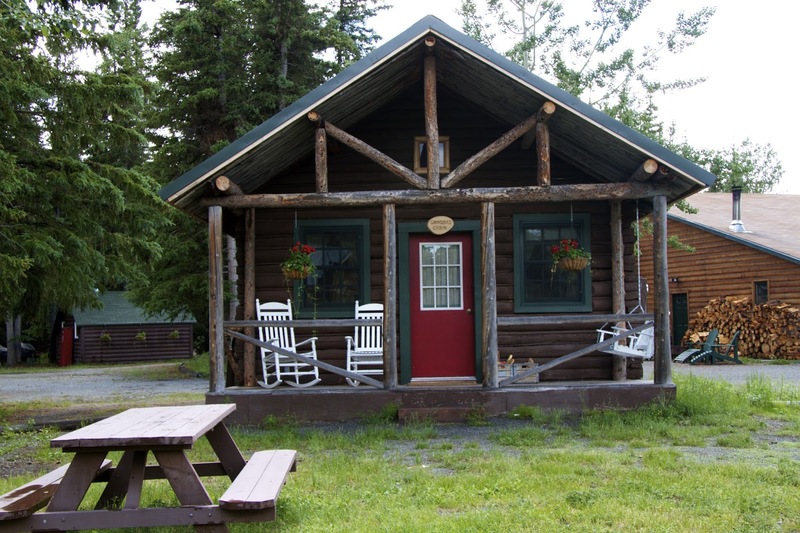 Some of the cabins have full baths and there is a beautiful bathhouse (for campers and the single room cabins) with a modern laundry facility. There is also lovely a glamper tent and they have plans to add a few more. For guests who prefer arriving by small plane rather than road bound vehicles, there is a landing strip. Richard’s own plane sits near the runway. They use this for personal touring and flying to Anchorage to pick up supplies for the lodge. Breakfast is offered for a minimal price of $5.00 so we opt to let Judy cook for us the next morning. At 2:00 AM the power goes out in the entire area and stays off until after we leave. No hot breakfast, but they heat water on their wood burning stove. Although it’s only instant coffee and yogurt, we enjoy great conversation with our hosts and a fascinating Aleut couple from Barrow (the northern most point in the state.) We are invited back for the 4th of July if we can’t find a spot further down the road. They are expecting a full house, but can always make room for Dimples. This lodge is a true gem. 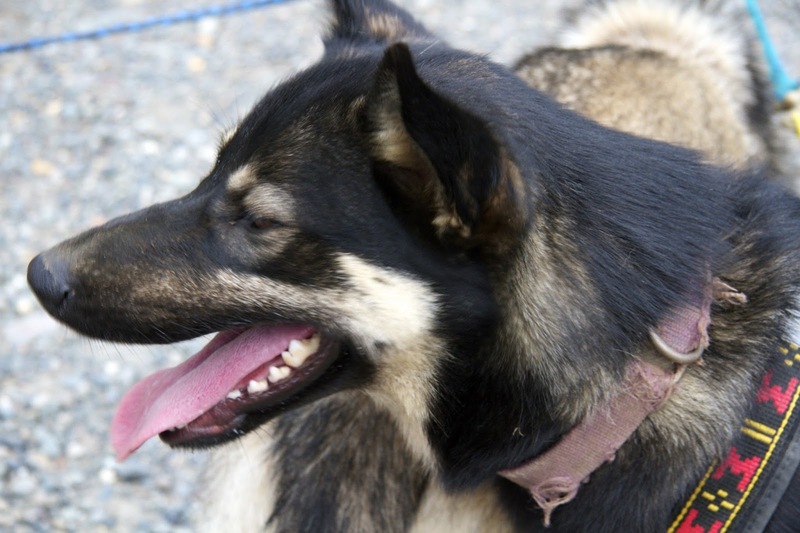 Then we’re off down the Richardson highway with a brief stop for diesel in Glennallen. We pass by the HAARP (High Frequency Active Auroral Research Program) facility and we catch glimpses of the Alaska Pipeline through the spruce trees. So it’s off to the Edgerton Highway toward the town of Chitna. We don’t see a lot of wildlife, but there is a herd of Yak… WTF? 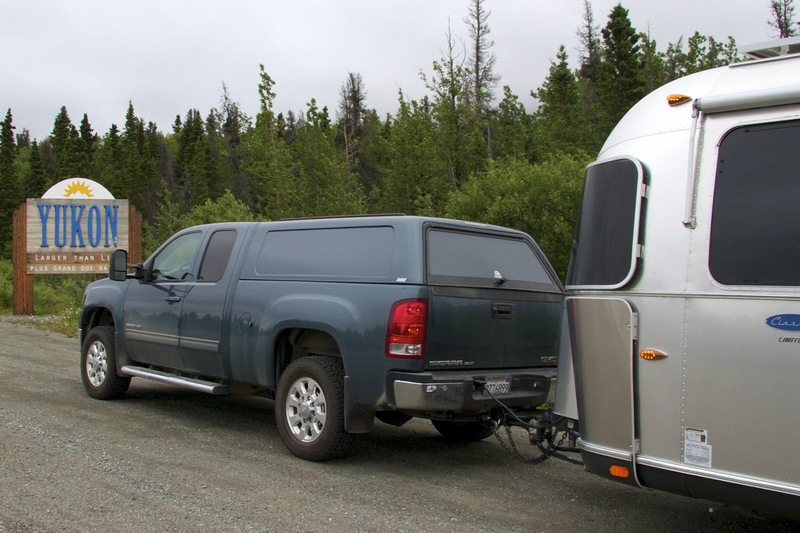 The Wrangell View RV Park is a tribal park with a self-service pay station, full hookups and no other amenities. The park is mostly gravel, but half of the spaces back up to the forest. Since there is only one other unit parked here we pretty much have our choice of spots and our view out the back is lovely. There is talk about a bear and her two cubs in the area, so we keep an eye out for her but she never shows while we are looking. From here it’s a short drive into Chitna. 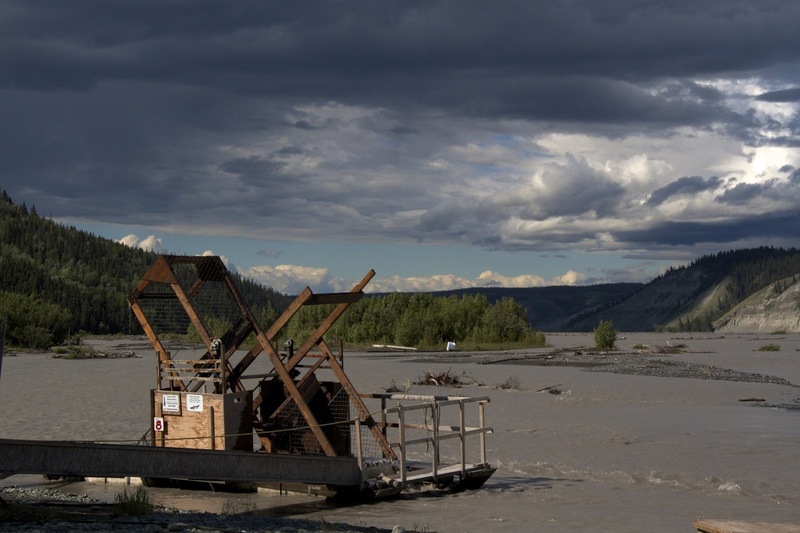 We check out the fish wheels along the river and chat with the owner of a fish wheel who comes all the way from Wasilla to fish the Copper River. It looks like pretty easy fishing, letting the wheel do all of the work, but you still have to clean and process a lot of Salmon. There is also dip net fishing along the river. We stop at the Hotel Chitna for hotdogs and burgers. Only it’s a really tasty reindeer sausage and a Yak Burger (provided by the Yak farm we passed along the highway) that is also quite delicious. Glad we don't have to drive on this! For the forth of July it’s off to the towns of Kennicott and McCarthy. The Edgerton Highway ends at the town of Chitna and the McCarthy Road begins with a narrow single lane cut in the rock and continues over the McCarthy Bridge. This is the only other entrance into the Wrangell & St. Elias National Park. The gravel road was built along the CR&NW (Copper River and North Western, or the local translation of the acronym: Can’t Run and Never Will) railway bed. We’ve heard horror stories about this road and many of the few businesses along this road offer tire repair. So we start out slow and after a few miles we discover that the road has been recently graded and is actually in better condition that many of the main highways we’ve been on recently. 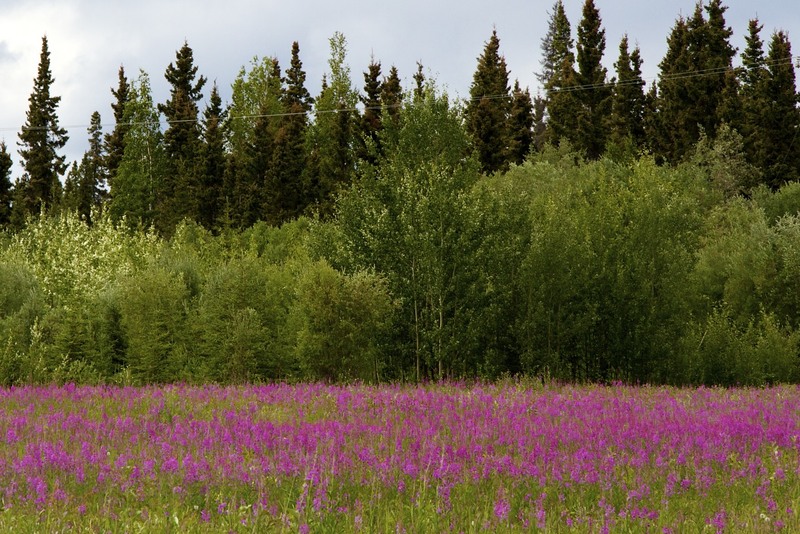 The scenery is spectacular, alpine meadows dotted with wildflowers, pine forests, marshes and ponds with swans and beaver dens, and along the horizon; the Wrangell Mountains covered with snow. A bull moose darts across the road and we’re reminded that although the road is in good condition it’s prudent to keep our speed down. After about 17 miles we come to the Kuskulana Bridge. This 525 ft. long one lane bridge, originally built in 1910 crosses 238 feet above the river. It’s a narrow 3-span steel railway bridge retrofitted with new wood decking and guardrails. Before the bridge was rehabilitated in 1988 many of the bridge planks were missing and motorists could glimpse the river below through the planks. It’s not as scary as back then, but it’s still a thrill to cross the river here. The road continues on up and over steep grades and at one point we see another bridge in the distance, this one looks really scary. Fortunately it has been abandoned and we only look up and marvel, rather than cross the canyon on that rickety derelict. 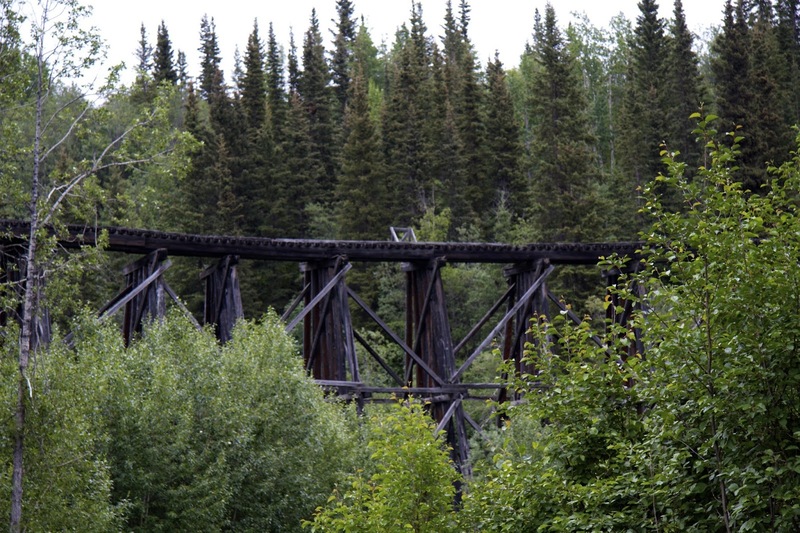 After 58 miles of gravel adventure the road ends at the footbridge over the Kennicott River to McCarthy and Kennicott. Parking at the bridge costs $5 but we opt to park in the free spaces at the small visitor center about a half-mile away and walk to the bridge. Once across the bridge we catch the shuttle to take us the five miles to the Kennecott National Historic Landmark. We hope to take a mine tour, but it’s the forth of July and tours are cancelled due to the parade and festivities in nearby McCarthy. 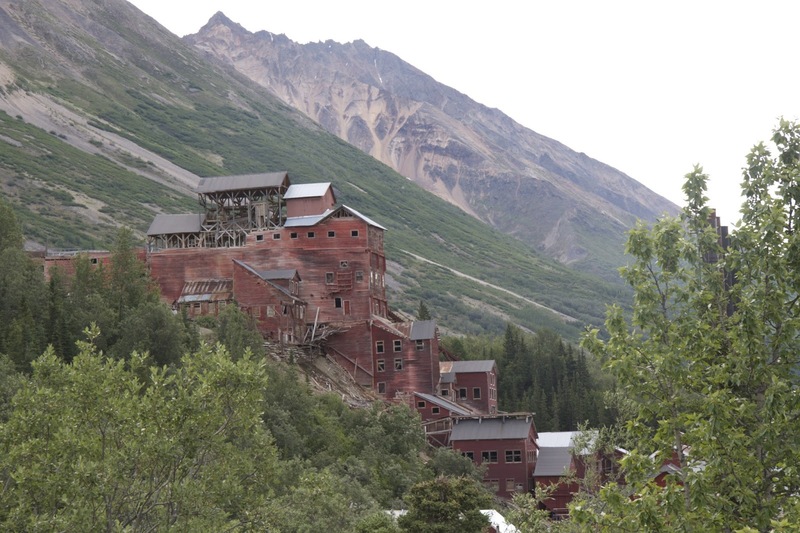 After stopping at the visitor center and catching a short film about the history of the Kennecott mines we hike around the Concentration Mine buildings and walk around the town taking tons of photos. We finish our tour of Kennicott with a really tasty elk sausage pizza from Tailor Made Pizzas that operates out of a converted bus and then head over to McCarthy. The town of McCarthy is best described as quaint and vintage. Most of the buildings are original, restored and maintained. Generators provide electricity and there is no trash service so residents have to haul out their refuse. We stop first at the town museum and see artifacts left by the inhabitants when the mine closed. Seems that, when the mine closed the workers and other residents were given 2 hours notice that the last train was leaving so they had to pack up whatever they could carry and everything else was left behind. In addition to the trappings of daily life, there is a display of handbills and memorabilia from early forth of July festivities. There were cash prizes for events such as: The Fat Man Fifty Yard Dash, Women’s Nail Pounding and the ever-popular Egg Toss. We head over to the main part of town to join in the festivities. 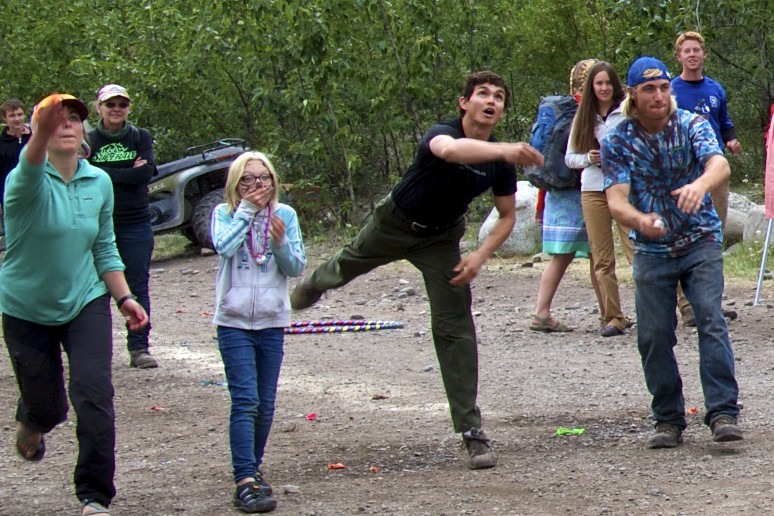 Modern times have added some different events like: a Slow Bicycle Race, Hula-Hoops and Paper Airplane Flying but the real crowd pleaser is the EGG TOSS. There are some really skilled egg tossers and catchers in this town! For a region inhabited by less that 30 folks in a thirty square mile area they really know how to put on a great 4th of July celebration. After the two plus hour drive back to Chitna, we stop for dinner at the Hotel Chitna. This time we feast on Halibut St. Elias: fresh halibut in a cream sauce with artichoke hearts and sautéed Copper River Salmon. Service again is excellent and the meal is a real gastronomical delight. We decide to stay here a few more days. 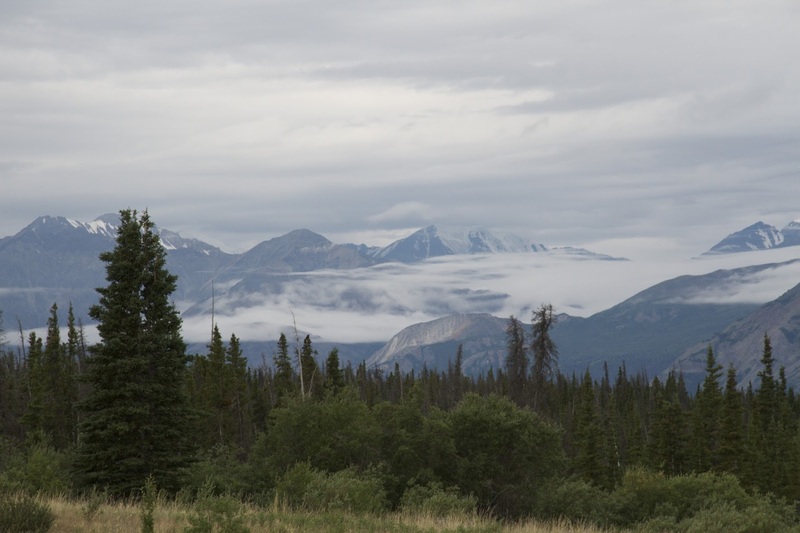 The weather is a combination of clouds, rain and sunshine, which is typical for Alaska Summers. More time to watch the fishwheels and explore the area. There is a free Wi-Fi spot in Chitna across the street from the hotel so we can check our email and do some more research about the area. While we are surfing, a large bull moose wanders by. Then one day we come across some folks cleaning salmon at their fish wheel. They tell us about a huge King Salmon that was caught in the wheel next to them that was probably over seventy pounds, when caught, the fish just jumped out of the basket and swam on up-stream to pass on it’s DNA for longevity. They also surprise us by giving us some Red Salmon Fillets and a nice chunk of King. What a treat! We are really thankful for a tasty dinner that night, and some for the freezer! The Edgerton Highway is dotted with ranches, farms and parks. So we spend a day along the road, stopping to take photos and just enjoying being here. At the Circle F YakRanch, we see a sign “Yak Meat For Sale” and some folks standing around a large black and white yak by the pens. We pull over, take a few photos of the yaks in the field and go see the man about some yak meat. Robert Fithian greets us and introduces us to large really mellow bull yak named Drifter. This yak seems to be content hanging out with people and being petted. Robert explains about the various breeds and his main products: meat, wool and breeding stock. These huge beasts are surprisingly gentle. So gentle, that Robert takes us into the field with the cows and calves so we can experience them up close and personal. Some of the beasts are a bit standoffish, but others come up to be petted and follow us around and the calves are just too cute! 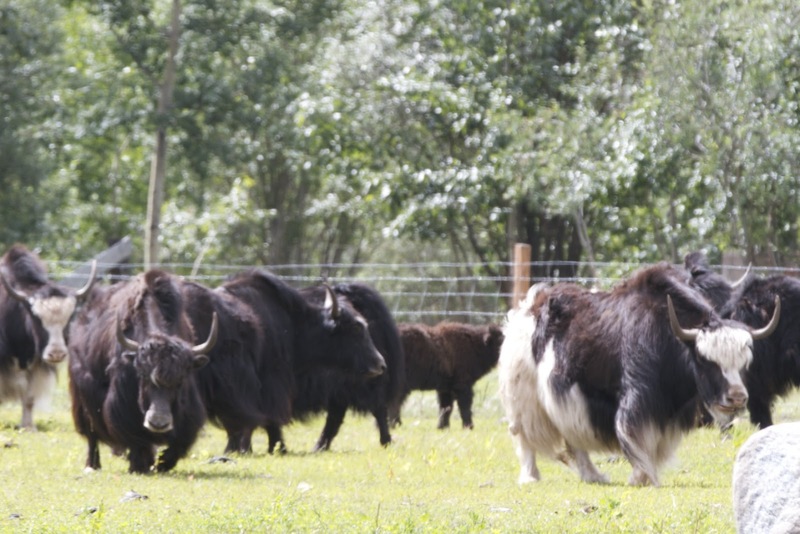 Robert tells us that yaks can be mean and dangerous if mistreated, but he obviously spends a lot of time with his herd, every one has a name. He points out each one and tells us a bit about each animal. Temperaments are as important as the meat and wool. He pulls off some of the soft wooly undercoat for us. It is soft and has no odor, even when wet, unlike wool. In fact there is very little odor here. Yaks don’t stink and neither do we after petting and mingling with the herd. Since we enjoyed our yak burger at the Hotel Chitna, we inquire about some meat. Robert’s wife, Barb gets us a price list and we decide on some yak burger and an assortment of steaks. Barb also spins the wool and she shows us some of her knitting. These items are light and soft much like cashmere… (I am so jonesing for a Yak sweater!) Well enough yakin about yaks. (OH NO not another bad pun!) Heading back to our home base we stop at Liberty Falls for some more photo ops. The last ferry ride of this leg of our journey takes us to Haines, AK. It’s beautiful cruising along the inside passage, we see humpback whales spouting off the bow of the Columbia, a perfect day for a cruise. For three days our home in Haines is the Ocean Side RVPark. We are right on the water with a wonderful view of the small boat harbor and within walking distance to downtown Haines. 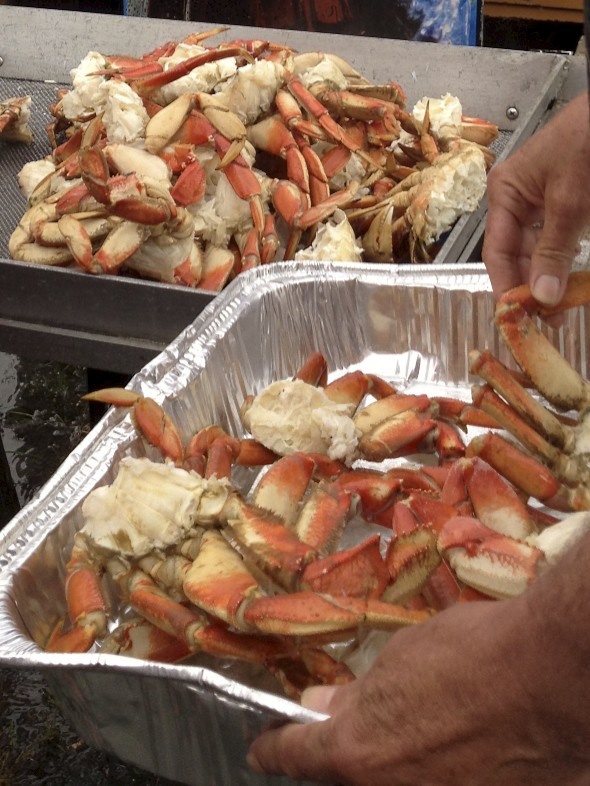 They even have a Dungeness crab feed and potluck one evening. Chris actually went down to the docks with one of the owners and another guest and helped clean 38 crabs for the feed. 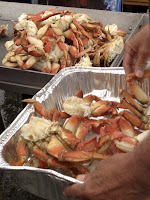 Now he can add cleaning crab in Haines Alaska to his ever-growing list-o-talents LOL. After setting up we stroll over to the Lighthouse Restaurant. We arrive just in time as they are expecting a busload of French tourists any minute. We get our order of Halibut Fish and Chips and a Captain’s Platter of: shrimp, halibut, wings and fried mozzarella before the crowd arrives. Although they are slammed, the service is friendly and the food perfectly prepared and delicious. Portions are large and we again have leftovers for some tasty fish tacos the next day. That night there is a huge storm. Thunder shaking and lightning flashing it’s pretty exciting, but we don’t know how exciting until the next day, when everyone in town is enthusiastically talking about the weather. Seems lightening in Haines is rare, so rare that the locals have never seen lightening like this. One man told us that his 18-year old daughter had never seen lightening at all, until last night. Had we know, we might have gone out and shot some photos, but standing outside near a line of metal RVs in a thunder storm just didn’t seem like a good idea. 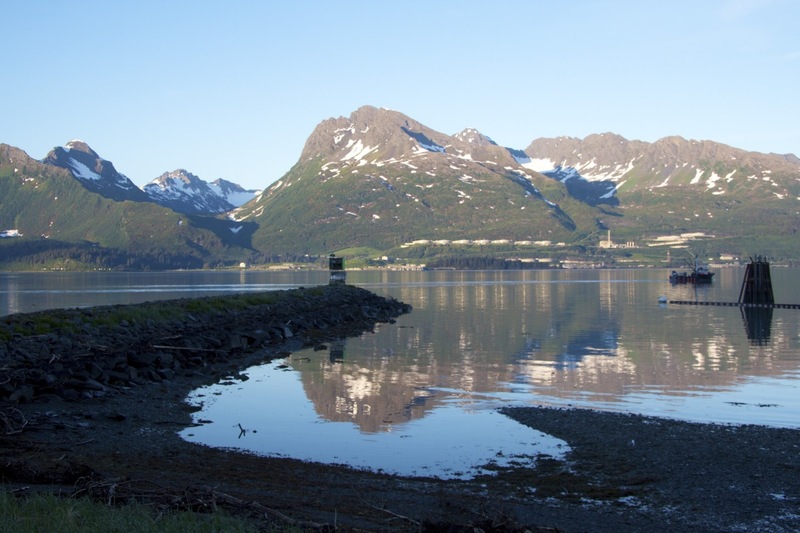 Haines has a few attractions worth visiting. 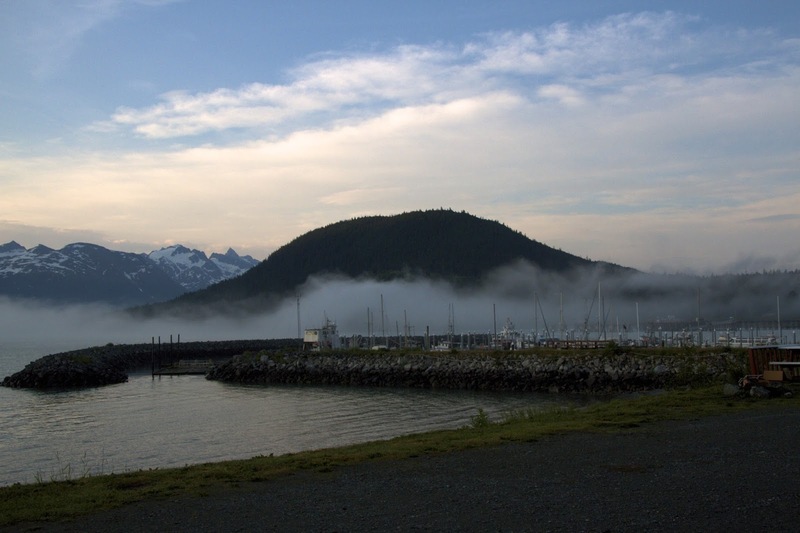 Historic Fort Seward has been converted to private residences and art galleries, but much of it is still intact and we can imagine a busy fort defending the Alaska Coast. At Alaska Indian Arts, Inc. we stroll through the working artist galleries, chat with some of the artists and purchase a small print by Greg Horner to mount on the wall above our media center. The Sheldon Museum and CulturalCenter has a wonderful collection representing the culture of the Chilkat Valley. They combine historic relics from the Tlingit culture, with nineteenth and twentieth century displays. Well worth a stop. 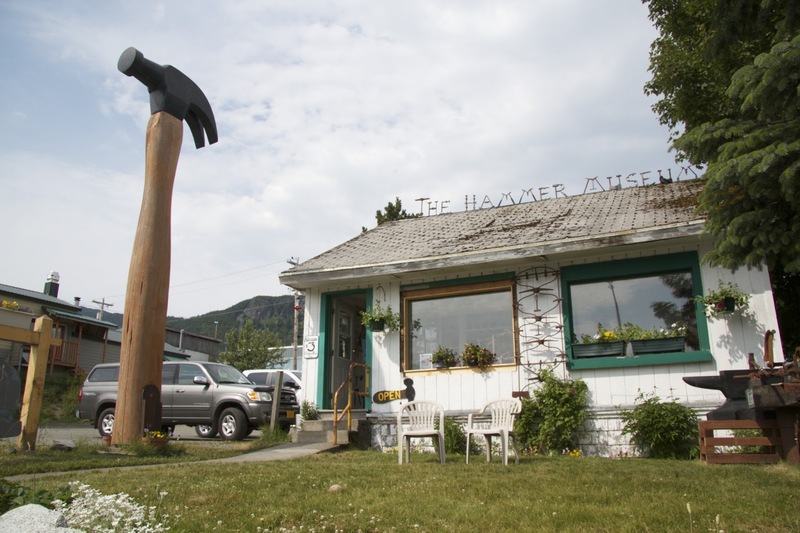 We assume that’s it for history and culture, but Haines has one more museum offering: The Hammer Museum! From the outside it looks like one of those quirky roadside attractions with a giant hammer standing in the yard of a small wood frame house, but inside there are examples of just about every hammer you can imagine and some we never imagined. This is the world’s first museum dedicated to the history of humanity’s first tool. With a couple of thousand different hammers on display (and thousands more in storage) this museum is quirky for sure, but it is also fascinating. The hammers are well documented and there are two young docents willing to share lots of information about the tools. We drive out to Chikoot Lake and hike a bit about the lake. Mosquitos are rampant but the ThermaCELLs work perfectly! There is a salmon weir across the river and we watch the poor ranger wading in the water trying to count the few early arriving salmon in the area. After three days we head out on the Haines Highway. 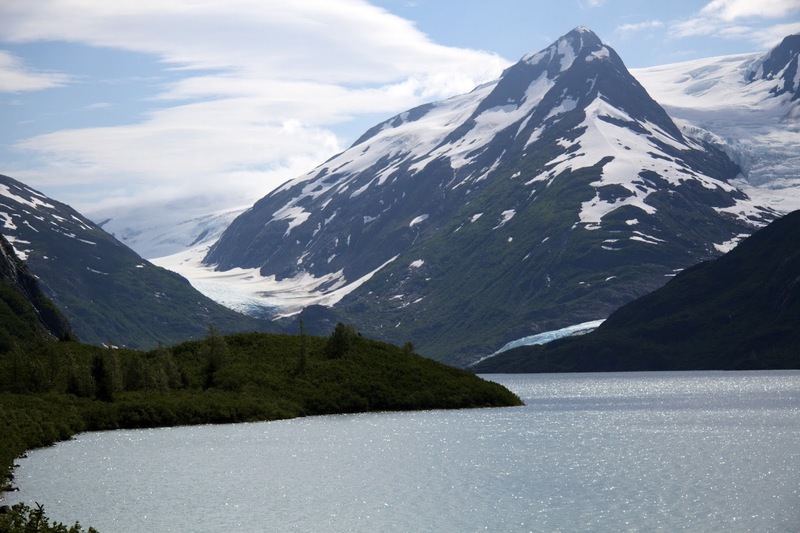 We have read and heard that this is one of the most scenic highways in Alaska. Unfortunately the road is shrouded in fog and we’ll just have to take their word on this. Not a lot of wild life either, just a couple of picas and a trumpeter swans. documentation (vehicle registrations, drivers license, insurance cards and passport cards.) We answer a few questions about where we were going and if we have guns, ammo, tobacco, alcohol, beer, pets and if anyone is in the trailer, no questions about food and we are sent on our way with a smile. 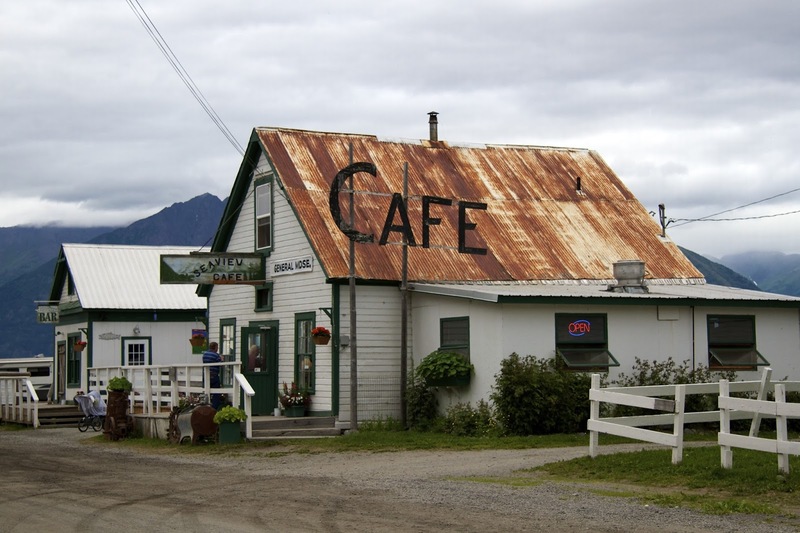 The list of attractions in Haines Junction is very short. 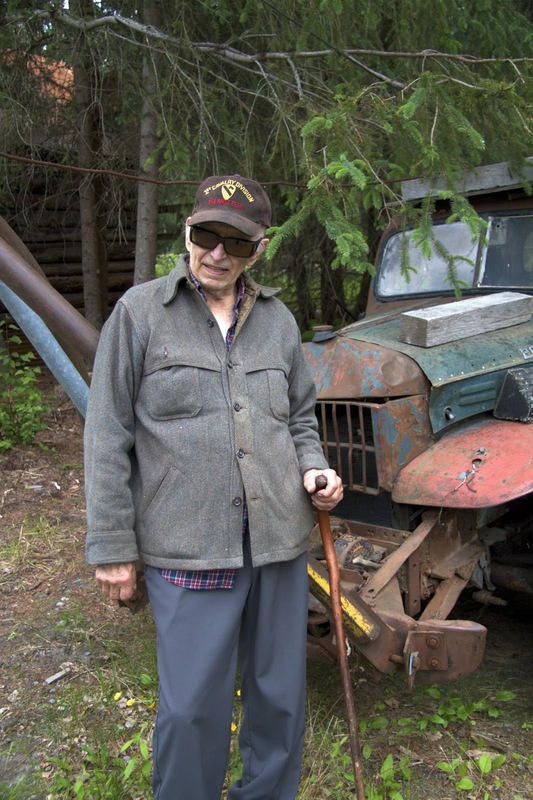 There’s the village monument at the junction of the Haines and Alaska Highways is a 24-foot high sculpture with area wildlife depicted in close to life-size detail on a mountain. It’s nick named “The Muffin” and belongs in the category of quirky roadside attractions that are just quirky. You can’t miss this one but there is another attraction that should be on the NOT TO MISS LIST! The Da Ku “Our House” Culture Center features Champagne and Aishihik First Nations cultural exhibits and the Kluane National Park Reserve Visitor Center. This is one of the finest visitor centers we have ever visited it’s World Class! Tons of hi-tech interactive interpretive displays keep us busy and stimulated until the center closes. The park is an empire of mountains and ice. Here in a vast international preserve, are most of the tallest peaks in North America and the largest ice fields outside the polar caps. Over half the land mass is permanently draped in snow and ice – the remainder fosters forests and tundra and stable populations of eagles, grizzlies and other species often at risk elsewhere. We’d like to stay and explore but Alaska is our goal this summer, so we will make it a point to return and visit this park in the future. So we rise early the next morning armed with our 2013 edition of the Milepost and head out on the Alaska Highway towards Tok. 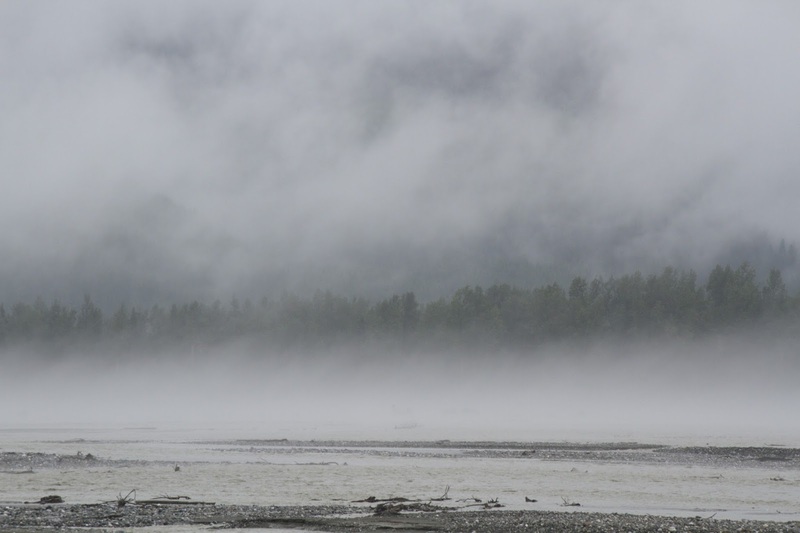 The skies are hazy and we later learn that there are 115 active fires burning in Alaska and even the main road between Anchorage and Fairbanks was closed for one day due to heavy smoke. The scenery should be breathtaking but much of the forests are brown and dry; decimated by the spruce beetle and clouded by heavy smoke. We make a brief stop at the Tachal Dahl Visitor Center, and learn a bit about the Dahl sheep in the area. No Sheep here this time of year as they are all grazing on the other side of the mountain. In the roadside attraction category we pass by the world’s largest gold pan in Burwash Landing. The road is everything we have ever heard about the ALCAN: rough frost heave sections marked by orange flags where we slow down, muddy sections, and some smooth sections where the road is recently repaired, you just never know what’s up ahead. It’s overcast and hazy with intermittent showers so we decide to push all the way to the border. 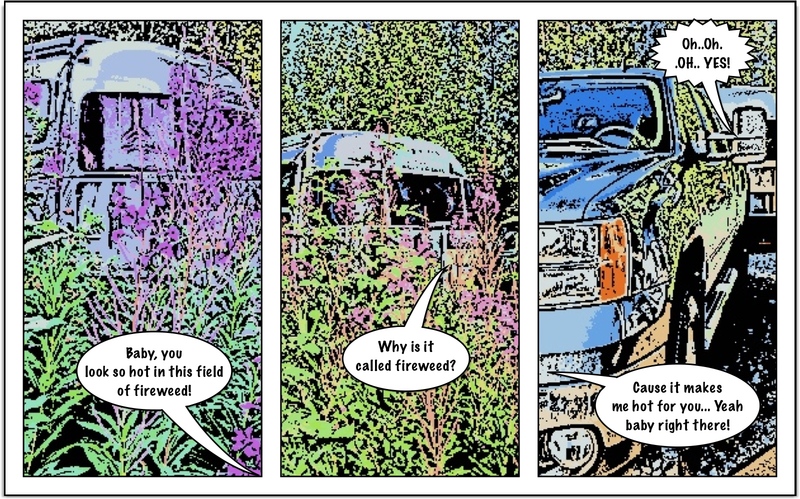 We keep our eyes peeled for Yukon wildlife. A pair of trumpeter swans fly parallel to the highway at the same speed we’re going (40+mph) and land in a pond and we finally see a scruffy black bear just before the border. A the U.S. border we drive through a big orange scanner (like the ones at the airport except it’s for vehicles) show the agent our passport cards answer a few questions about guns, pets and if anyone else is in the trailer and are welcomed back to the U.S. We then drive the 90 miles onto Tok and along the way we finally see our first moose. WOO HOO! Everyone driving into Alaska has to pass through Tok. For such an important crossroads we note that in peak season, the multiple RV parks are pretty empty and vacancy signs abound on the hotels. There are multiple gas stations, one well-stocked grocery store and a few small businesses catering to locals and tourists. They have a fancy visitor center that is a clearing-house for brochures about anything you can do in the state. Talking with some of the locals they describe the town as a boom and bust town they also note that this year they are seeing more large RV’s so they hope that the next boom is on the way. Like the rest of Alaska they are having a heat wave and for us the smoky air is a déjà vu from last summer. In Tok we stay two nights at the Tok RV Village. The spaces are all full service pull-through and they give us one free hour of Wi-Fi per day. Since everything is within walking distance we leave Dave and Dimples hitched. Fast Eddies is the only restaurant in town and they don’t let that go to their heads. Service is fast and friendly and the food is excellent. They offer a great salad bar with lots to choose from and their other dishes are generous. The seafood platter is fresh, crisp and delicious and the Alaskan Burger is just about one of the tastiest burgers ever. It’s also so huge that one order can be shared. We actually eat there twice it’s so good!